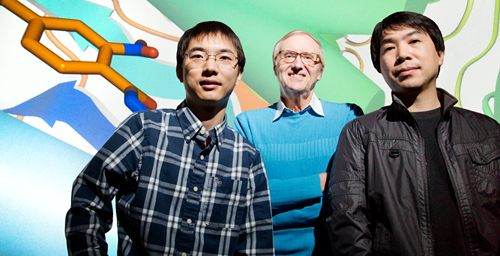 University of Illinois chemistry professor Eric Oldfield, center, graduate student Wei Zhu, left, research scientist Yonghui Zhang and their colleagues at UC San Diego discovered a compound that cured drug-resistant Staphylococcus aureus infection in mice. CHAMPAIGN, lll. - Researchers have discovered a new compound that restores the health of mice infected with methicillin-resistant Staphylococcus aureus (MRSA), an otherwise dangerous bacterial infection. The new compound targets an enzyme not found in human cells but which is essential to bacterial survival. The research team, led by scientists at the University of Illinois and the University of California, San Diego, reports the new findings in the Proceedings of the National Academy of Sciences. The team discovered and developed several compounds that are promising leads for antibacterial drug development, and the most potent was tested in mice infected with MRSA. The rise of antibiotic-resistant bacterial infections is a global public health problem, said U. of I. chemistry professor Eric Oldfield, who led the research with UC San Diego professor Andrew McCammon. "There's an urgent need for more antibiotics because of drug resistance," Oldfield said. "There are, for example, completely drug-resistant strains of tuberculosis. None of the drugs work against these strains of tuberculosis ,and so, if you get it, you die." Other infections, such as gonorrhea, which once were easily cured with antibiotics, also are becoming resistant to treatment, Oldfield said. "And Staph itself actually kills more people in the U.S. than does HIV/AIDS." To begin the study, McCammon and his colleagues at UC San Diego used computer simulations to look for potential chinks in the armor of a bacterial enzyme known as FPPS that aids in bacterial cell wall formation. The researchers then screened libraries of small molecules to identify some that might target those sites and interrupt the activity of FPPS. Oldfield's team tested some of these molecules against FPPS, but found that they were not particularly potent inhibitors of the enzyme. "Then we tested the most promising compound against the next enzyme in the pathway, and we found that it was 20 times more active against that enzyme," Oldfield said. That enzyme, called UPPS, "is important because it's involved in bacterial cell wall biosynthesis," he said. "And a lot of the antibiotics that we have - drugs like penicillin, methicillin, vancomycin - all target bacterial cell wall biosynthesis." Graduate student Wei Zhu and research scientist Yonghui Zhang worked with Oldfield to develop and test new analogs of the compound that worked against UPPS. "And we found one that was about 1,000 times more active than the first hit we had against FPPS," Oldfield said. Illinois chemistry and Institute for Genomic Biology professor Douglas Mitchell tested the new compound against regular and drug-resistant S. aureus in cell culture and found that it had potent activity against both. "He also found that it augmented the effects of methicillin" in methicillin-resistant Staph strains, Oldfield said. In a final test, Dr. Victor Nizet at UC San Diego used the new compound to treat mice infected with MRSA. "Twenty out of 20 animals survived if they were treated with this drug lead and zero survived if they weren't treated," Oldfield said. More years of study will be needed to determine whether this compound or others like it will be effective in humans, Oldfield said, but the findings may allow scientists to target multiple enzymes essential to bacterial survival, thus reducing the likelihood that new forms of drug resistance will emerge. The National Institutes of Health, National Science Foundation and Howard Hughes Medical Institute supported this research.